The intersection of Chouteau and Grand has long been an empty entrance into St. Louis University’s south campus and SSM Health Saint Louis University Hospital. However, if you drive by now, it’s bustling with activity as construction workers go vertical with a new Saint Louis University Hospital and new outpatient care center. 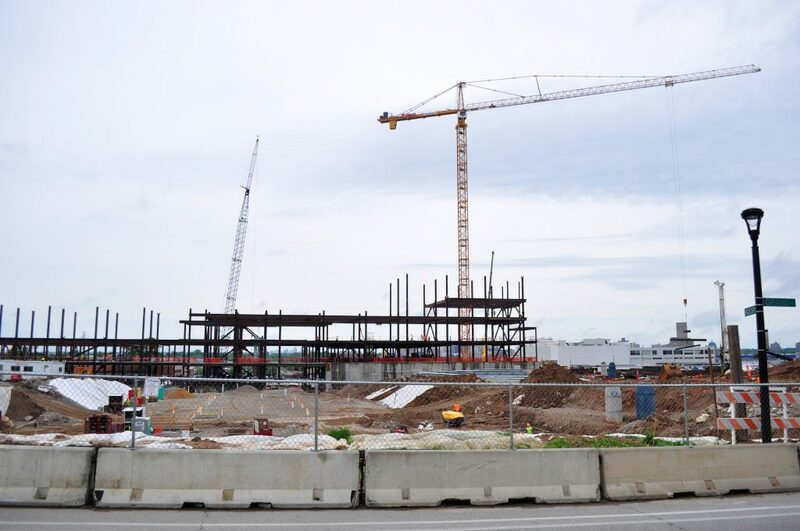 Sitting just a quarter mile south of Metro’s Grand Transit Center, this new investment will bring more hospital workers, patients, and visitors near public transit. SSM Health Saint Louis University Hospital boasts more than 802,000 square feet of hospital and outpatient care facilities, including 316 new beds on 10 floors, a 4-story ambulatory care facility, a large parking garage, and an expanded emergency department. The project will cost $550 million, making it a huge investment for SSM Health and the surrounding neighborhood. Construction began in August 2017 and completion is planned for September 2020. Alberici Constructors Inc. is the project’s construction manager. The architects, St. Louis-based Lawrence Group and Millwaukee-based Hammel, Green and Abrahamson included some innovative design features to ensure the hospital serves its patients and workers as best it can. To further promote the educational mission of the hospital, the designers planned alcoves in hallways so that doctors, residents, and students can huddle near patients, rather than blocking hallways. The hospital grounds will include green space and lots of natural light, in hopes to make it a healthier, more pleasant place to be for hospital workers and patients alike. Leaders of the project wanted to create a “design studio” which features life-size models and actual fixtures and locations of items in the patient rooms in the new hospital. Staff members will be able to experience those rooms and provide input on design changes and additions to ensure everything is perfect. This project also sits just south of St. Louis’ newest district, named by popular vote as “Prospect Yards.” The announcement of the new hospital helped create momentum for more transit-oriented developments around the Grand Transit Center. The half-mile area is now governed by St. Louis University’s 353 Midtown Redevelopment Corporation, and will soon see the City Foundry and Armory redevelopment projects, which will bring new offices, restaurants, and a food hall to this part of the city. Ward 17 Alderman Joe Roddy has been active in building this momentum around transit in his ward. “This project is an example of how the St. Louis region can do a better job of coordinating urban planning, investment, incentives, and transportation to help build car-optional neighborhoods around transit, he said.